Albert Alvarez takes the oath before testifying at the joint legislative oversight committee, Tuesday March 12, 2019 in Trenton, NJ. Alvarez, a former Murphy administration official accused of sexual assault but not criminally charged discussed the administration's hiring practices during the hearing. A key unanswered question after months of legislative hearings is who hired Alvarez at the schools authority. 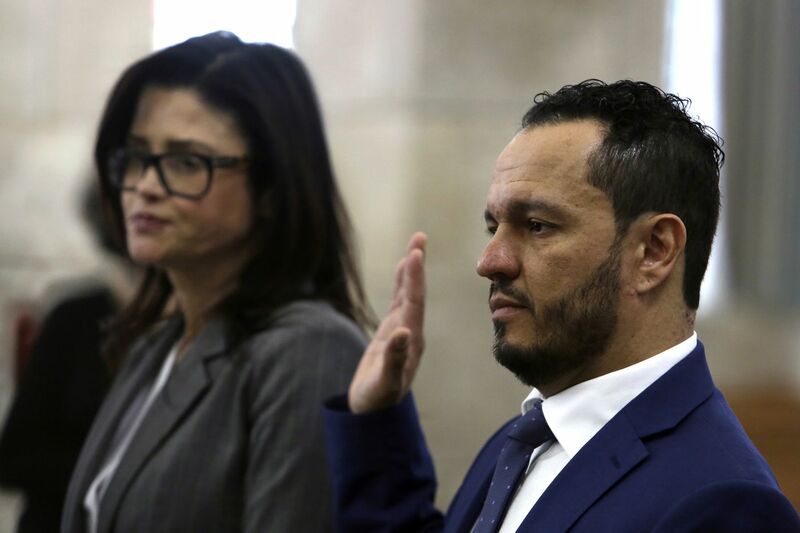 TRENTON -- Al Alvarez, the former Murphy administration official accused of sexual assault, told New Jersey lawmakers Tuesday that he had been falsely accused and that the allegation had “devastated” his career. Appearing in public for the first time to address a controversy that has consumed Trenton for months, Alvarez maintained that his sexual contact with Katie Brennan, a Murphy campaign volunteer who now works in the administration, was consensual. For months, lawmakers have been grilling top aides to Democratic Gov. Phil Murphy over his administration’s handling of Brennan’s allegation. Despite dozens of hours of testimony from Murphy administration officials and others, lawmakers have been unable to find an answer to a simple question: Who hired Alvarez, the former chief of staff at the Schools Development Authority, even after top Murphy officials had been aware that Alvarez had been accused of sexual assault? As it turns out, not even Alvarez himself could give a definitive answer. Alvarez, 44, who worked as deputy director of personnel on Murphy’s transition team after the 2017 election, said he had spoken with the transition chief and Murphy’s incoming chief of staff about working at the SDA, which manages school construction. Alvarez ended up with the $140,000-a-year job, but he couldn’t say who directly authorized the hiring. He was later given a $30,000 raise. His first boss, then-CEO Charlie McKenna, was a Christie administration holdover. McKenna has said he didn’t hire Alvarez. “Who hired you?" asked Michael Critchley, an outside attorney for the legislative committee investigating the controversy. “I couldn’t tell you,” Alvarez responded. He did agree with Critchley that it was a “safe assumption” that either Pete Cammarano, Murphy’s first chief of staff, or chief counsel Matt Platkin approved his employment. They have said they did not make the decision to hire Alvarez. Alvarez’s testimony offered the latest drama in a scandal that has dogged the progressive governor. In December, Brennan, chief of staff of the New Jersey Housing and Mortgage Finance Agency, told lawmakers that top Murphy aides failed to act when she alerted them that she had been sexually assaulted by Alvarez during the 2017 campaign. Alvarez, through his attorney, had denied the accusations and said he had consensual sexual contact with Brennan. The administration on multiple occasions told Alvarez he needed to leave state government, according to testimony from Murphy aides. But he didn’t resign his position until he was contacted by a reporter for the Wall Street Journal months later in October 2018. In February, a law firm hired by the governor’s office to investigate the matter wrote in a report that it was unable to determine who hired Alvarez. “No witness during our interviews or before the Legislature stated that he or she hired Mr. Alvarez or recommended him for placement at the SDA,” the report said. “Nor did anyone identify the person who did. Additionally, there does not appear to be any documentary evidence that answers that question." Two county prosecutor’s offices have investigated the sexual-assault allegations and declined to bring charges against Alvarez. On Monday, Politico reported that prosecutors informed Brennan in October 2017 that the DNA evidence they had collected did not match Alvarez. Alvarez on Tuesday also offered new details about his interactions with the governor’s office. Alvarez responded that he was willing to resign, so long as the administration would help him find a job, according to his testimony. A divorced father of two, Alvarez explained to lawmakers that he needed time to find a new job so he could fulfill the “responsibilities and obligations” to his family. Alvarez testified that Platkin agreed to help him find a job. When Platkin followed up in July or August, Alvarez informed him that he had applied for a job at Rutgers, according to Alvarez’s testimony. Around that time, the governor’s office reached out to the university, and Rutgers agreed to interview him, according to NJ Advance Media. He didn’t get the job — and there’s a dispute over whether he even applied. A spokesperson for Murphy told NJ Advance Media that the governor’s office had simply been seeking an update on Alvarez’s job search. Platkin testified in January that he had informed Cammarano, the chief of staff, about Alvarez’s search at Rutgers. Platkin said that he did not recall offering Alvarez assistance at Rutgers but that he didn’t think he had discouraged him from seeking employment there. Alvarez told lawmakers he wasn’t aware that the governor’s office had contacted the university. In any case, he said, “I had no expectation ... that they actually were going to” help him get a job.